Do you have what it takes to stay safe and protect your property when floods strike? Well, you better be prepared! When floods slam their gates open, the results can be disastrous. Floods are the number 1 natural disaster in the United States, and the National Oceanic and Atmospheric Administration says they kill about 82 people every year. So, lots of unfriendly water is filling up in your home. You must be asking, what should you do after a flood? Let’s take a deep dive and figure it out. The sudden nature of floods makes them very deadly. Sometimes they creep in on us during the night, catching us unawares. If you are caught up by floods before you evacuate, move to the top floor or attic, or climb up to the roof immediately, and stay there until help arrives. Avoid wading through flooded water, because it could be electrified. Even if you’re certain that power is out, the water could still be electrically charged by wires installed on downed power lines. And what should you do after a flood if it doesn’t catch you at home? Don’t try to get into the property. Although you could be tempted to try and salvage some valuables, nothing is worth your life. Never walk or swim into a flooded house. The whole thing could collapse in on you or the water levels could keep rising and drown you. You must wait until a local government authority says it’s safe to go in. Insurance companies feel the bite of floods, too. Between 2006 and 2015, insurance claims worth $1.9 billion were filed across the country. In Texas alone, 9,670 flood claims were filed in 2015, resulting in payouts worth over $520 million. If your property is insured against the risk of flooding, what should you do after a flood? Get on the phone immediately and call your insurance company to come over and assess the damage. Don’t touch or remove anything from the property before your insurer arrives. Some insurers are known to play hardball with clients when they believe an insured item was tampered with after the flooding. You can, however, take photos and videos of the property, including ceilings and walls, electrical systems, heating and ventilation equipment, kitchen appliances, furniture and other household items. 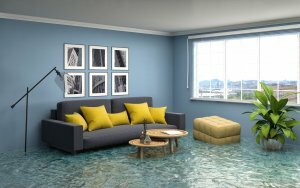 Floods can cause extensive structural damage to a building, including its foundation. In Dallas and Fort Worth, TX, foundation problems are even more common after floods, mainly because of the region’s expansive soil conditions. Once you’ve cleared up things with the insurance people and signed a compensation agreement, call in repair professionals to evaluate post-flood foundation damages and other structural faults, and estimate the cost of repairing the property. You can also take matters into your own hands and check for any structural faults before the repairer arrives. Look out for cracks on the floor or floor coverings and check whether doors and windows are fitting perfectly in their frames. Bulges in foundational walls are also a sign of a potential foundational problem. Whether you choose to go in or wait for a professional, it’s important to ensure the building is not at risk of collapsing before you begin to clean it up. If your home has never been flooded before, gear up for a messy aftermath! Floods can sweep all manner of debris, from twigs to large clay particles, into your property. Although most people are usually in a rush to get everything back in place after floods, rebuilding takes time. Floors and walls, for instance, can take up to a month or even more to dry completely. Cleaning up after a flood is usually a tiring process, but someone must do it. For starters, you will need the right flood-cleanup clothing and tools, such as gloves, masks, boots, mops, pails, squeegees and plastic garbage bags. You may also need dehumidifiers, vacuums, and submersible water pumps. Begin by opening windows and doors to let in clean air, remove floor coverings, furniture and other household items that need to be cleaned or discarded. Next, drain out flood water that may have pooled on the basement floor. Don’t pump it out all at once, since sudden changes in moisture and temperature can damage foundational walls or cause floors to bend, crack or collapse. Use a shovel to scrape mud off hard surfaces. If the mud is stuck on damp surfaces, let it dry then brush it off. Use appropriate disinfectants to disinfect all surfaces. Avoid using chlorine bleach to disinfect metal surfaces, because it reacts with many metals. Clean carpets and rugs as quickly as possible, but they must be discarded if the area was affected by sewage flooding. Use dehumidifiers to speed-dry surfaces. However, walls and floors should be left to dry naturally. Discard all contaminated foods, cosmetics, and medicines. Consider hiring a professional cleaner to take up some of the cleaning tasks. For instance, if mold is already developing on some surfaces, a professional cleaner is better-equipped to combat it and advise on how to prevent future growth. Also, don’t forget to get qualified technicians to check your property’s power points, electrical systems and gas fittings, and make necessary repairs before you start using them again. When floods strike your neighborhood, there is nothing that prevents them from showing up again, especially when you live in a flood-prone state like Texas. You must, therefore, take steps to protect your home from future floods. In addition to repairing existing faults, your repair pros should be able to make structural adjustments that can flood-proof your property. For instance, they can use flood-resistant repair materials, re-install electrical sockets higher up the walls, fit non-return valves on drains and pipes, and mount high shelves for storing high-value items. Sure, floods can have devastating effects, but you can always rebuild and reclaim your property. Even though the process can be emotionally and financially draining, the secret to starting all over again on a solid footing lies in finding an experienced, professional company to help out with the repairs. Also, purchase adequate flood insurance cover for your home. If you have ever asked, “what should you do after a flood?” there is no doubt you now know how to ensure your personal safety and protect your home in case the disaster strikes.